s of heritage and related issues is the focus of the Trust. While it was decided that the Trust undertake city-centred programmes, the only exception was the Champaner-Pavagadh project. Champaner-Pavagadh, 40 kms from Baroda, is the once prosperous medieval capital of Gujarat, that we found was completely neglected and what’s more, dangerously threatened by the operation of more than 100 stone quarries in its immediate vicinity. It is with a sense of great pride and achievement that we can announce today that the Trust's efforts over the last 18 years have culminated in Champaner-Pavagadh being selected as India's nomination for World Heritage Site status in the year 2004. Heritage Trust was formed a year before the late Rajiv Gandhi established INTACH (Indian National Trust for Art and Cultural Heritage) in Delhi. Looking at our activities, INTACH has Heritage Trust deemed the Baroda Chapter of INTACH. So while we are a part of INTACH’s activities, we are still autonomous and independent. Heritage Trust is registered as a Trust with the Charity Commissioner and eligible for exemption under section 80 (G) of the Income Tax Act. It is also registered with the FCRA and eligible to receive funding from foreign sources. 1985: The Trust persuaded the Baroda Museum to prominently display the famous Akota Bronzes and other city-related artifacts that have established the antiquity of our city. These artifacts were earlier put away in the Museum storeroom. A Special Exhibition, Heritage of Baroda, was organised on this occasion, inaugurated by Shri B K Nehru, then Governor, Gujarat. The Trust designed a special Plaque installed on Leheripura Gate explaining its significance. 1986: The Trust organised a seminar "Save Sursagar" with the Baroda Municipal Corporation, where Mr. Sherban Cantancuzino, Secretary, Royal Fine Arts Commission, London, who had directed the cleaning of the Thames project, presided. A street exhibition was also mounted at Sursagar, opposite the Music College. A detailed plan was created. It included cleaning up Sursagar, revitalising its water through the introduction of aquatic flora and fish, etc., re-routing traffic to create promenades for people to walk around, streamlining the fast food vendors on the shore and structuring a waste management system to dispose leftovers, lighting up the heritage buildings on the banks to create a wonderful city centre. In spite of several follow-ups with the Baroda Municipal Corporation over many years, these plans continue to gather dust. 1987: First 3-day Workshop on the Architectural Conservation of Champaner-Pavagadh held at Champaner, presided over by Sir Bernard Fielden, Chairman, ICCROM, Rome. Attended by national level architects, archaeologists, art historians, environmental journalists and so on. Decided to press Government of Gujarat to ban quarrying in the area. A 7-day ICCROM Workshop on Education in Architectural Conservation was also held in collaboration with the Department. of Architecture, M S University. 1988: Heritage Club for Children established. 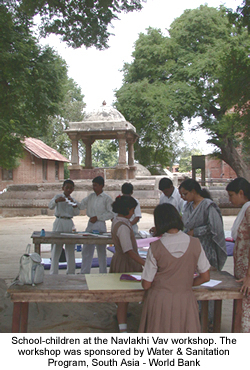 Workshops on Traditional Terracotta Toys (140 children, 7 schools), and at Hajira, the only Moghul monument in Baroda (with CCRT, Delhi, 627 children) held. Visits of children to the Baroda Museum accompanied by informed guides and Slide Shows with the Department of History on Secular Historical Sites (200 children) organised. The Trust revived the Shehnai Chowghadia programme of Gaekwadi Baroda. This is an important Aural Heritage of the city, where the Shehnai was played from the Palace Gates at fixed times every day. We even located the same family of shehnai players whose descendants were in the city and still playing the shehnai. 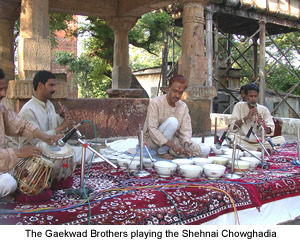 The programme was held at the Leheripura Gate, where the Gaekwad Brothers played early mornings on three days every week. It was inaugurated by Pt. Bhimsen Joshi. 1990: The Chowghadia programme was shifted to the Band Stand, Sayajibaug, due to objection taken by the GEB who have a substation nearby. It was inaugurated by Ustad Bismillah Khan, the shehnai maestro. This programme continues even today. The Gaekwad Brothers have added Jaltarang to the Shehnai. It is thoroughly enjoyed by the hundreds of early morning joggers and strollers in Sayajibaug. It is supported by ONGC. 1991: The Trust identified and listed 75 Old Buildings of Baroda for an INTACH project. 1995: First Champaner Dance Festival, Mallika Sarabhai performed "The Story of Champaner-Pavagadh". The Trust filed a Public Interest Litigation in the Gujarat High Court to ban quarrying in the environs of Champaner-Pavagadh, as all our efforts with the Government of Gujarat over the last 8 years have failed. 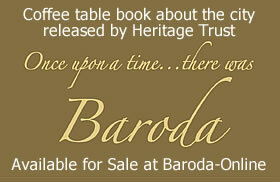 The Trust publishes a book on Baroda for children, in English and Gujarati. 1996: The second Champaner Dance Festival, Astad Deboo performed with the Gundecha Bandhu singing the Dhrupad. The programme was sponsored by General Motors who launched the Opel Astra at the function. Then Ambassador of US to India, Frank Wisner attended with a delegation of 40 top US industrialists and businessmen. The Trust prepared the Heritage Conservation Act with urban heritage byelaws for Baroda city and presented to the Government for approval. 1997: The Supreme Court bans quarrying in Forest areas. This strengthened our PIL in the Gujarat High Court. As 80% of the Champaner-Pavagadh area is under Forest, most of the quarries closed down. Major plus for the Trust. Now we could concentrate on actual issues at this heritage site. 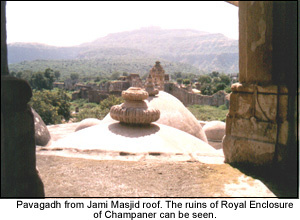 1999: The Trust successfully nominated Champaner-Pavagadh to the World Monuments Fund (New York)’s 100 Most Endangered Heritage Sites of the World for the year 2000. 2000: Government. 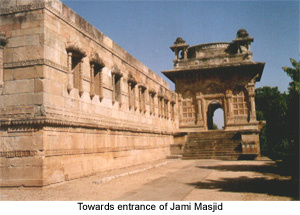 of Gujarat formed Task Force on Champaner-Pavagadh for protection, conservation and development of the site. The Trust received US $ 20,000 from WMF (General Electric Global Fund) towards creation of a Comprehensive Management Plan for Champaner-Pavagadh. 2001: The Trust completed Visual, Historical and Architectural Documentation of 120 heritage monuments at Champaner-Pavagadh. The Trust received 3000 pound-sterling from INTACH-UK Trust which was used in organising a Workshop on Landscape Development of Champaner-Pavagadh monuments with University of Illinois, Urbana-Champaign, USA and Department. of Architecture, M S University. 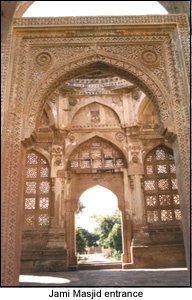 2002: Champaner-Pavagadh became India’s nomination to UNESCO’s World Heritage Site status for 2004. The Trust instituted the Viraasat Lecture Series which will feature an eminent person in the vast field of heritage issues. The inaugural lecture was delivered by Professor. George Michell, well-known architect-art historian who has done path-breaking work at Hampi. The Trust organized the third Champaner Dance Festival featuring Sharara Shakti Ascending, choreographed by Chandralekha with live vocal accompaniment by the Gundecha Bandhu. It was supported by the Reliance Group and the Archeological Survey of India. The Trust published a Reprint of Prof R N Mehta’s Monograph on Champaner and Champaner and the Magic Mountain, a book for children written and illustrated by eminent Baroda-based author, Rani Dharkar. A book on the extensive documentation of the 120 monuments at Champaner-Pavagadh is under publication. All three books are in collaboration with the Archeological Survey of India. The Heritage Club organised a 3-day Workshop on Vavs (Stepwells) at the Sewasi Vav (300 children) in association with CCRT, New Delhi, and a 5-day Workshop at the Navlakhi Vav (1000 children) with the World Bank. The Trust organized an exhibition of old photographs of the city, "Vadodara : The Changing Face of a City, 1898-1986" at the Baroda Museum, in association with Friends of Museum. It was financially partly supported by United Way of Baroda. All the programs of the Heritage Trust are supported by project funds. Fund raisers and membership costs help us barely cover general administration costs and in organization of large scale free events like the Viraasat Lectures and other event support. We welcome members (Life membership: Rs. 10000, Corporate membership: Rs. 25000).